Send a message. Send dicks. Ladies and gentlemen, we live in amazing times. Whether you’re a huge gummy fan, or you just know someone who deserves to literally eat an entire bag of dicks, DicksByMail.com is the Internet service you didn’t know you needed (but you do). 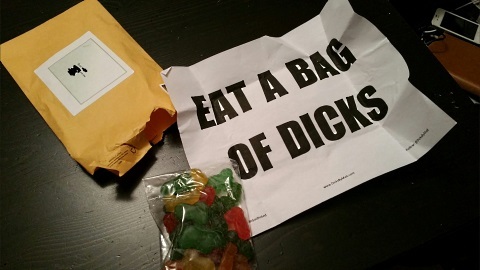 For just $15 + shipping, DicksByMail.com will send your enemy of choice a 5-ounce bag of gummy dicks, suitable for snacking and general WTF-ery upon receipt. The key part: This package will be sent anonymously, and will simply include a note that says “EAT A BAG OF DICKS” inside. That’s it. Its simplicity is its beauty. What are you waiting for? You know at least one person who really deserves a mailbox full of dicks. DicksByMail takes all major credit cards and PayPal, so place your order asap. 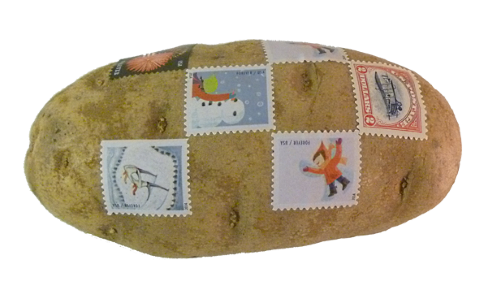 For just $9.99, the fine folks at MailASpud.com will mail a Russet potato to anyone you want (in the U.S.). The potato won’t be wrapped in any way. Instead, it will just have the address written on the outside, and appropriate postage affixed. Your recipient won’t know a damn thing about why or how this potato got in the mailbox, and that’s the beauty of it. No matter which gift you choose to bestow on your chosen enemy, we highly doubt they’ll be expecting either potatoes or dicks to show up in the mail.